Yesterday, November 25th, the Bitcoin price continued to edge lower and managed to reach the 3,500 level. As we have mentioned in our last weekly crypto analysis, we expect support around 3,500-3,000 area and now that the price had reached the upper band, what can be expected next? Statistically speaking, V-shaped bottoms occur less than 20% of the time and given the impulsiveness of the downward move, we do not expect that to happen in the current situation. 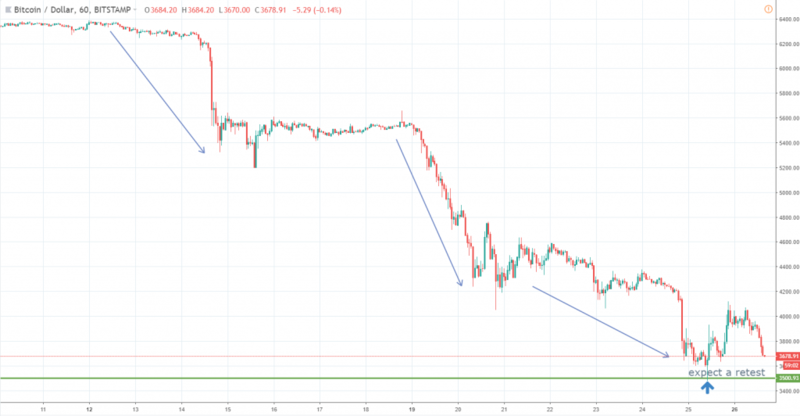 The Bitcoin bloodbath had continued, and we can notice three waves of impulsive selling which wiped out around 40% of the Bitcoin value in less than two weeks. Given this impulsiveness of the downward move, although we saw a bounce off the 3,500 key level, we expect sellers to retest the level again and it will be up to the buyers who will need to protect that area. Keep in mind that Bitcoin volatility is up again and false break setups could occur, meaning we could see a brief break below 3,500 and buyers to resume afterward. We’ve discussed in a previous article how the company behind the New York Stock Exchange will launch the Bakkt platform which will also include a new Bitcoin futures contract. The platform launch date was scheduled for December 12th, but unfortunately, the date had been postponed until January 24th, 2019. 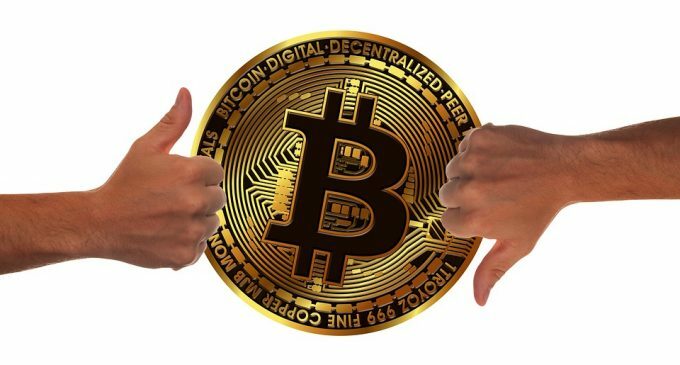 It would have been a great opportunity to see new institutional money pouring into the cryptocurrency market and most likely, the downside move had been accentuated by this news, which came out a few days ago. Despite a positive seasonality for the fourth quarter of the year, a Bitcoin recovery until the end of December looks to be compromised. Still, for people who are currently sitting on the sidelines, opportunities to buy could show up next year. As we have stated in our last weekly crypto analysis, Bitcoin dropped more than 70% six times since its creation, so a rebound is not out of the table. With regards to institutional inflow, sooner or later we expect it happen, due to no correlation with other asset classes + we are currently in an environment with relatively high prices, which leaves very limited options on the table for buyers. Heavily depressed markets might be favored because of that, and the cryptocurrency market qualifies right now.